I'm off to a dinner tonight for which the dress is, somewhat unusually these days, black tie. Last night I dug it out and cursed when I realised I hadn't dry cleaned it since the last dinner so I set about restoring it. Smartening up the jacket is pretty straight forward; a bit of steam and a brisk brush with a boot brush will liven it up. It's the trousers the young blade about town needs to take care with. So, here is a top tip from an old blade because we don't want our nice barathea trousers looking shiny because we've used an iron directly now do we? Simply get your copy of the Telegraph, lay a sheet down the crease and press the trousers as you would normally. There is enough moisture in the paper to fix the crease without getting shiny marks down the leg. This method has the additional benefit of leaving your newspaper nicely pressed. Mrs Flashbang thinks I should have been a butler. As PG Wodehouse said, "Her face was shining like the seat of a bus drivers trousers." 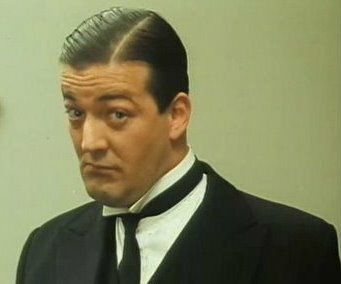 Her remark was a little intuitive I suppose, given my only role to date on stage and screen was as an extra in Jeeves & Wooster. The demanding role required me to sit in a chair in the Drones Club drinking whisky, smoking an untipped cigarette while reading a 1928 copy of the Times. Stephen Fry and Hugh Laurie also had a few lines apparently. The adjutant turned to him and dismissed him with, "Serves you right for buying a DJ in material that melts rather then burns."